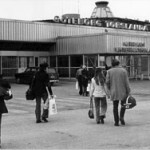 All the photos, images and facts featured on this website have been gathered and collected by a group of people who have an in-depth knowledge of Torslanda airport’s past and how it developed over the years. This is primarily due to a passionate interest in aviation and, in some cases, through employment in different roles and with different employers at the airport. It was agreed to try and collect additional material in the form of images and texts, thereafter putting it all together for the compilation of a book about Torslanda Airport. Many have contributed with images and texts to this book, all of whom we would like to express our grateful thanks and appreciation. In view of the vast amount of material we have received, it was not possible to include everything in the book. At the same time the book was completed and published in 2007, a website was launched enabling much more of this material to be uploaded. 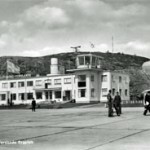 Not only did this include numerous photos of the airfield and its surroundings, but also aircraft and aviation operations and activities at the airport. The book was titled “Torslanda Flygplatsen på framsidan” and it should not be forgotten that an enormous amount of time, effort and resources have gone into its compilation and publication. In 2007, the book was distributed to all members of the Swedish Aviation Historical Society (Svensk Flyghistorisk Förening: SFF), as the annual Aviation Historical Review. The book (in Swedish language only) is now available for purchase from Björlanda-Torslanda hembygdsförening, price SEK 150 + postage and packing (order here). A DVD film is also available for purchase, price SEK 100. incl. postage and packing. (order here). The first master plan for Göteborg’s air harbour was drawn up in 1921. The plan included an area for seaplanes, a specific circular area for the tethering and mooring of airships, as well as take-off and landing areas for land aircraft. In the end, the plan consisted of a classic triangle layout airfield for land aircraft directly adjacent to a seaplane harbour. 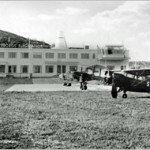 In conjunction with the opening of the International Aviation Exhibition in Göteborg (ILUG), HRH Crown Prince Gustav Adolf inaugurated Göteborg Airport on August 4th, 1923. The whole article can be found in the “Articles and statistics” section. 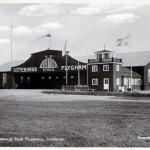 The group of people who have created the book “Torslanda Flygplatsen på framsidan“ and compiled the material about Torslanda Airport’s history are: Björn Kärf, Jan-Olof Wetterholm, Lars Ekström, Nils-Olof Andersson, Sven-Erik Davidsson and Thore Kristoffersson. This web page is continued work from the book: “Torslanda Flygplatsen på framsidan“ by Lars-Inge Grundberg and Nils-Olof Andersson. Lars Ekström, Nils-Olof Andersson, Sven-Erik Davidsson, Jan-Olof Wetterholm, Thore Kristoffersson och Björn Kärf. You can also request answers to any questions you may have relating to the airport.